I love all your cards. The first one is my favorite. Bold yet simple. These are wonderful. I am so going to CASE your top thank you card. It's such a simple, but elegant design. Love it! And what am I thankful for this weekend? A picture of a poppy made me think of my Dad. He was in the Army during WWII and then when he got out, worked for the government his whole career. Giving back, always giving back. I miss him, but both of my parents instilled in me a deep desire to pay it forward in whatever way I could. 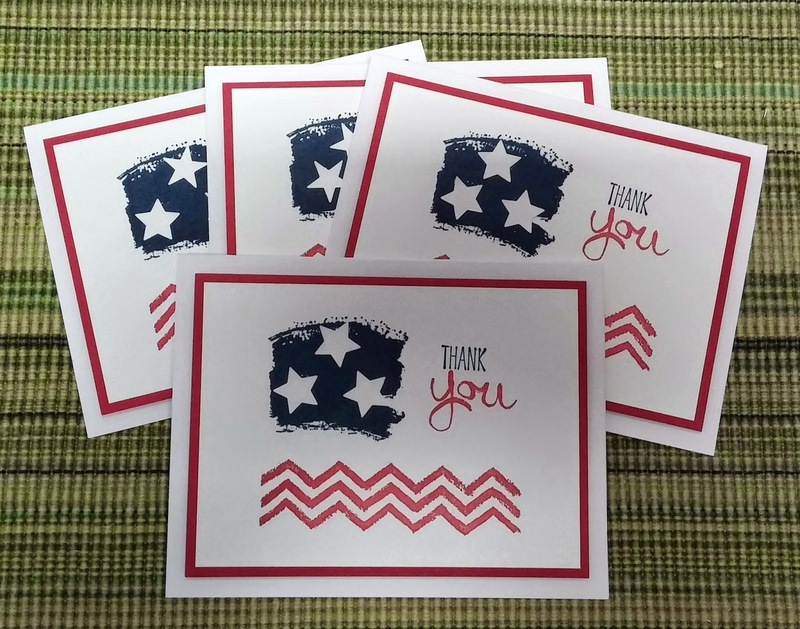 Now that I'm retired, I devote a lot of time to making cards for OWH to help our servicemen and women keep in touch with home. I am so grateful I found Sandy and her mission. In my small way, I can keep giving back. Yup, feeling thankful. Lovely cards. I'm thankful for so much I cannot even list it all. Mostly lovely family and close friends. My crafty friends too. Thanks for a chance to win also. I love the last cards - the watercolory ones. Do you have a tutorial on that technique? All in all, great cards! Thanks for sharing. I love the design you made with the stamps! Beautiful! Very pretty cards! Thanks for your sharing your creativity! All of your cards are just gorgeous! The first card is just beautiful with the stamps and placement of the images. The flag card is just perfect for the sentiment - I may CASE it with some papers I have. I'm so glad that SU! 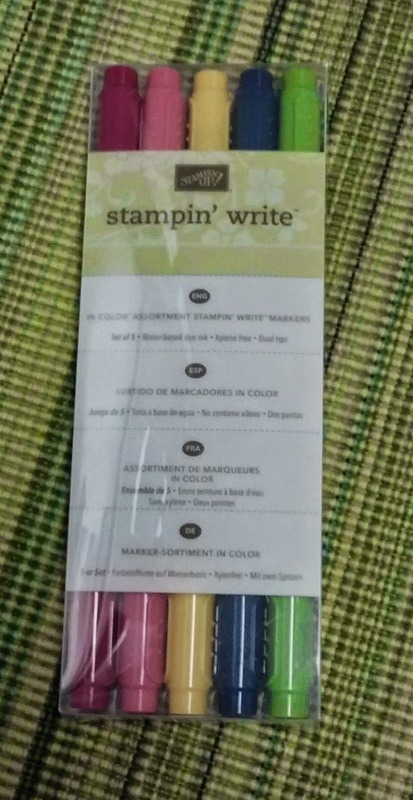 made that watercolor stamp and you are making cards with it. I have a very similar one from Papertrey Ink and I very definitely need some inspiration and the card you made is definitely an incentive to try again. I agree with Cindy that I am grateful for cardmakers, like you, that give me a different perspective and inspiration. As always, I LOVE all your cards, but the first one, which is so eye-catching CAS with the bold blue swathe and chevrons is probably my favorite! Awesome cards!!! The first one is my fave though! You always make such wonderful cards. Gives me so much inspiration. Thanks for your support for OWH. I love all of your cards, as I always do!!! I am with you about your card making skills growing with OWH. It is so nice you get together with card makers at lunch time. I am thankful for my family, friends and for card makers like you who give so much inspiration. I love the cards you made! 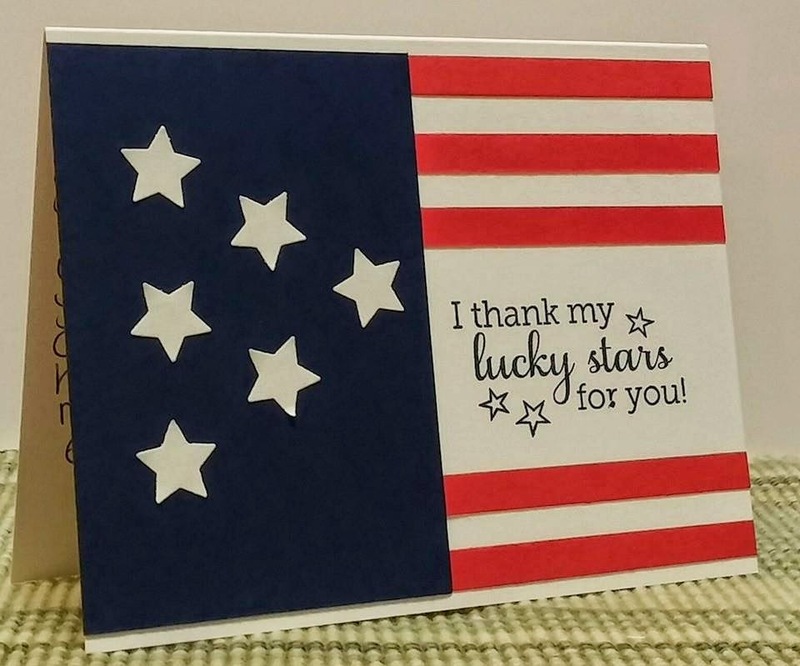 I think I like the one with the sentiment "I thank my lucky stars for you" because I just love that sentiment and the red, white and blue! 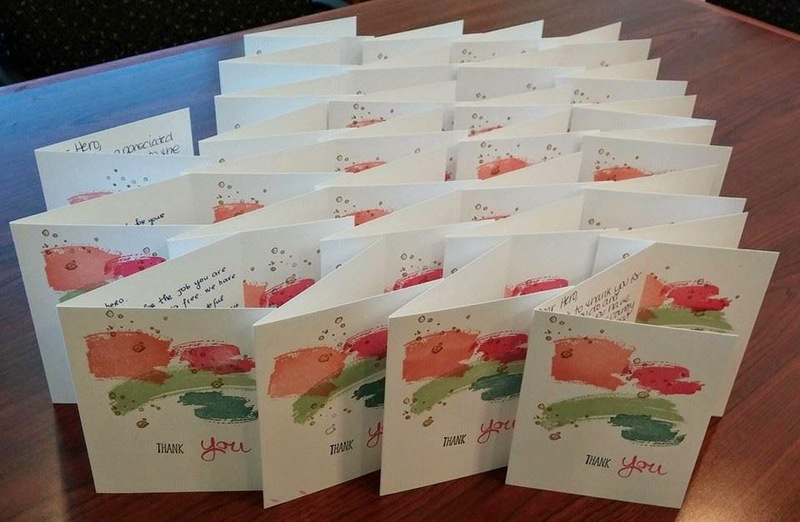 Thankful for everything ... including making cards for OWH. You always have such nice cards, I really like the first one, very striking. I like all of your cards, especially the first one. These cards are adorable and I especially love the first one with the zig zags! Seongsook, I am always so impressed by your cards and how you have gotten so many others involved, especially in writing a Any Hero notes. You are an inspiration to so many! I love the way you put together things and they just look like they were meant to be together. Your card is wonderful! What makes me thankful is people like you dedicating their time and talents for the benefits of others. Beautiful cards Seongsook! How nice you have co-workers who help OWH too. Thanks for your support of OWH and have a great day. I think the "I thank my lucky stars" card is my favorite. Love that it re-creates the flag and the sentiment is awesome! How wonderful of you and your coworkers to spend your lunch breaks working for our heroes. I love all your cards. You have a great CAS style. Thanks for sharing your cards. I come to your blog occasionally to check out what you've done and get new ideas for OWH. Thanks again! I always have loved your cards, they are bold, bright and very well done. These are all wonderful cards! My fave is the first one. The layout & colors are perfect! I am so thankful we have service men & women who put their life on the line for us every day. This country would be nothing without them & I give thanks every day for them. Great card! I love how you deconstructed and beautifully represented the flag. You inspired me to try something similar. Thanks for joining the blog hop! Really nice cards. Clean and simple yet classic and elegant. All three are wonderful; my fave is "I thank my lucky stars for you". I'm thankful for my husband -- injured in 1967 in the Army and still coping with his disabilities with a smile. Great cards! I am thankful for my family! Beautiful cards! What a nice surprise it would be to find one of your cards in the mailbox! I'm thankful for so many things. One is OWH, and their never ending support of our troops. Thanks for sharing! Especially inspired by your first card...that set is on my wish list and I think this will be the first card I case with it! Not the first time you've inspired me :) Thankful to belong to such a great team, OWH! Great cards as usual! I didn't know that you meet every Thursday at work to do these. What a wonderful idea. Your cards are always so "clean" looking. Six years! What a great supporter of OWH and Sandy Allnock. Good idea to have card making at lunch time. You can make a difference even with a busy life and a job. Love your cards. I check your blog every now and then,and pin some of your works. Thanks for sharing. It's great that you can share your card-making with your co-workers! I love the simplicity of your cards - I'm saving them all for some CASEing! I also make cards and would love to check each blog every day, i try. Seongsook, your cards are beautiful! Thank you so much for your dedication to OWH for so many years! ♡ I am so very thankful for my family, friends, and all of the lovely people I've met through papercrafting! I love all of your cards and know you have such a fun time making cards with friends during your lunch time. I especially like the smeared ink look with the stars on the 1st one. The stars and stripes design on the 2nd one is awesome....love it with that sentiment. The fun colors on the last set will surely brighten someone's day! Great job to you all! I remain thankful every day for the many blessings in my life. Recently, a tornado ripped through my 71 year old mother's neighborhood 4/28 and hers was one of the 2 homes that did not have a tree in the roof. So thankful she was spared. Thanks so much for all you do for OWH! These cards are lovely! I like how you used the New SU set to make the flag. I'm thankful for folks like you who support OWH and provide us all with so much inspiration to create cards for the troops. I've been following your blog since last year's blog hop and appreciate what you have shared. Thanks for your support of operation write home and the opportunity to win. I love your pretty cards and that they are simple enough to make multiples of. I'm so thankful for my family's good health! Happy Memorial Day! I am thankful for my salvation! I am Thankful for my family, friends, hugs from my kids, and knowing my Heavenly Father. Oh, and Thankful for the Internet, without it, I wouldn't have met all you wonderful ladies. Thank you for all you do for OWH. I'm thankful and grateful to our troops, since without them we wouldn't enjoy all the other things that I'm thankful for! What beautiful cards! I like the stars! I am thankful for a country like ours, and the freedoms we enjoy! Wow, these are all great. Great cards! So pretty. I also like that you wrote you get to together with your co workers to do cards on Thursday= such a great idea!!!! I truly appreciate the fact that we can all do something for our military to make something pretty and enjoyable considering all they do for us! Great cards! I so need that stamp sets! I am made thankful because every day I am able to wake it I am given another chance to get right with God, and to be thankful for what I have and what is done for me! slnewby at gmail dot com. These are all awesome cards! I think its great you and your co-workers get together each Thursday and make cards. I am thankful for our men and women in the military that put their lives on the line each and every day so my family is safe. I'm also thankful for my family and friends. very cute!!! The first one really caught my eye. Thanks for the share! Your cards are fantastic! I love that you get together with coworkers on Thursdays at lunch to make cards. What a wonderful idea! Great variety of AnyHero cards. How awesome that you meet every Thursday with your coworkers to make cards. Thanks for supporting OWH. What beautiful cards you and your co-workers make. They are awesome and don't be surprised if a few get case. Thanks for sharing. Your cards are lovely! I really like the second and third cards. I am loving the popular watercolor that is popular. It's so nice that you can make cards during lunch and enjoy the company of co-workers. Awesome cards...I particularly love the stamps used on you first card! I am thankful for my family, particularly my dh; his love and support! Love all the cards. I'm a sucker for stars and stripes. Super card. And I'm thankful for all the men and women who are on active duty or who are veterans of our armed services. What lovely cards... and what a great idea to make cards with colleagues during lunch. I am thankful for the many freedoms we enjoy because of the service of our troops, including my father-in-law and uncles. Absolutely stunning. I adore the first card and will be casing it. It is so simple, but elegant! What am I thankful for -- I'm thankful for this great country we live in and the men and women who serve to keep it strong and great. I'm thankful for the service my Dad and other family members gave as well as for my hubby of 45 years and my service -- we entered the Air Force on the "buddy" system and I'm thankful to have him home with me. God Bless all our troops and their families today and always. These cards are awesome! I love that first one's simplicity and boldness! Great job! Thank you! 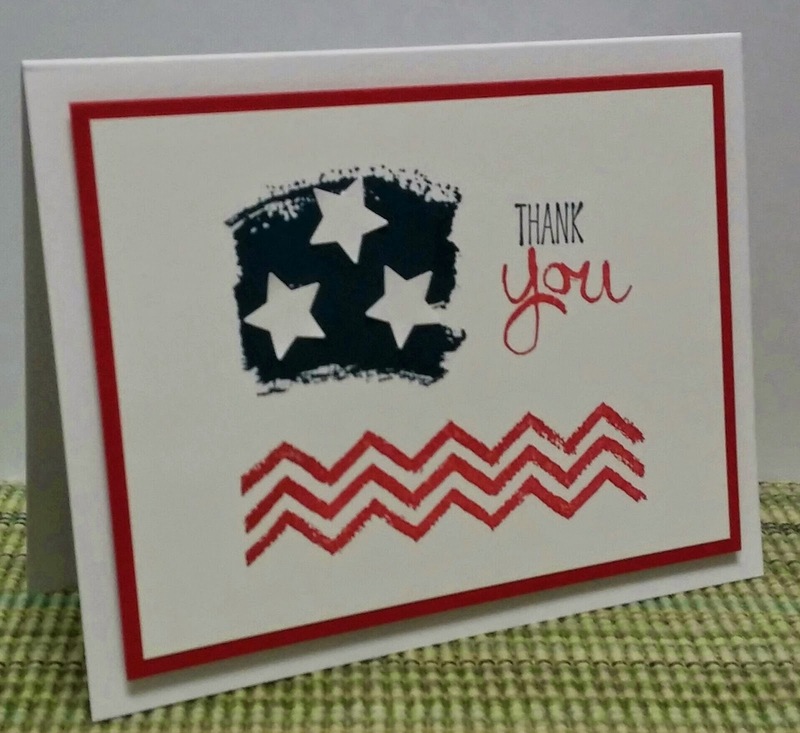 Beautiful flag rendition on your blog hop card. Thanks for your long-standing support of our service members through OWH. The cards are both great-very different styles-both strong in their own ways. I am grateful for a good DH who cares for and puts up with me. I am grateful for a decent home. It isnt huge but fine for us.We have electric, running water and heat when millions around the world do not. I am grateful to be in a country of opportunity not available everywhere in the world...if you are willing to work hard...you can improve yourself. I am grateful for the people willing to stand up and fight for this country...to keep it free. We have problems but we have so many things not available elsewhere. Everyday I am grateful....to see a blue sky and pretty flowers,...for a hot cup of tea coming in from a cold rain...a decent bed after a long day of work. Like I said...got 10 hours? Your card sets are just wonderful! I love the CAS design and fresh look! I am thankful for my family, who are always supportive of me no matter what I do...as long as I try to be my best self. I am also thankful for the opportunity to express myself through crafting...which is what helps keep me sane when my toddler and 6 month old are running me ragged...lol! I love the thank you cards. I'm thankful for my family and friends. All of these cards are great! I can't believe you have found a group at work to create with! I really love that flag card :) I am grateful for all the Heroes who sacrifice so much for our country, and especially today (Monday) for those who gave the ultimate sacrifice. I know that without them, we would not enjoy the freedoms we have today. Thank you, Aimee! You see many different responses from people at work. I am blessed to have those who share their time with me. Thanks for your thoughts that I totally agree with. "I am grateful for all the Heroes who sacrifice so much for our country, and especially today (Monday) for those who gave the ultimate sacrifice. I know that without them, we would not enjoy the freedoms we have today." How did you do the first card? Love it. This weekend it occurred to me that every man in my family since the early 1900's has been in the military including my husband and his brothers. My paternal grandfather wasn't even a citizen yet but wanted to fight for his new country (WWI). Proud and thankful to each and every of these heroes. Becki, thanks very much for sharing your family's services for the country. Because of their sacrifice, we are here free. For my first card, I just stamped three images including the sentiment from the Work of Art stamp set from the Stampin' Up! and created the American flag. I am happy it turned out great. Thank you for your generous contributions to OWH. My father and his youngest brother both fought in WWII but I never thought to ask if my grandfather or if he knew if his grandfather served in the military. I have something I need to ask my uncle. Thank you, Diana, for sharing your story. I didn't know either until I heard my sister's father-in-law's funeral that he fought in the war. It must be not easy topic to bring it up. Bobbi, I always enjoy your wonderful creations even though I haven't said that often. Thanks for your support. Thank you, Stacy. I am so blessed to be able to do it. I am thankful for my church, my family, my friends and for being born in a country that is free. And I'm thankful those those who are willing to give their lives for my freedom. I'm thanks ful for a lot! April, you are blessed to be born in a country that is free. You are blessed to know that and being thankful for those who gave their lives for our freedom. Thanks for your comments. Love the cards! What does CASE mean please? I'm thankful that after all these years my brother is finally getting help for his PTSD. He served 3 terms in Vietnam and came home a mess. It took many years but he finally getting help! Hi Paula, CASE means in the craft world that Copy And Share Everything. If you like my card, you can make copy it exactly the same or slightly change and share with others. I am sorry to hear about your brother but happy to hear that he can get help finally. I will pray for him getting well and better help. Thanks for sharing the story. Seongsook, I am glad you stuck around OWH also. I have been here for 5 years now and you have been a great inspiration.Thank you. There are so many things I am thankful for, but family, friends, our heroes and OWH are high up on my list. Love your cards and your style! Especiaaly like the Work of Art card. I amthankful for health and family. So thankful for my dad who was in Vietnam who is now getting help through the VA for PTSD issues. Great assortment of cards here. I like the different ways in which each mimics a flag blowing in the breeze. I'm thankful for good health, good weather, good family and friends, and for those who work to keep our country safe.